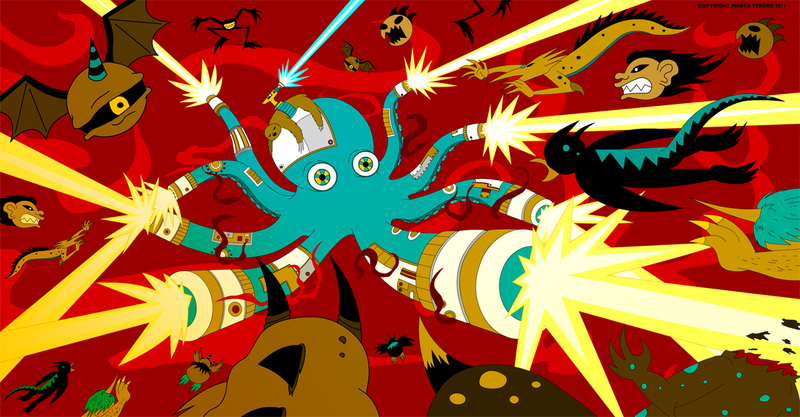 Drawing Request 02: A flying cyborg octopus, that is in the bowels of hell, fighting off a horde of demons with his varied lasers, and being aided by his sloth sidekick. I am very happy with this piece and luckily, so is Ben! 2 down...8 more to go! you killed this one Marta! HAHAHAHAHA! Oh boy, you are so funny. And BRAVE! These are very challenging requests, but you're knocking them out of the ballpark! This whole thing is a hoot, but the sloth is brilliant. Love it. Super illustration love it, I love bizarre things like this.